US$12,242.60 spent so far out of US$418,104.06 total this year, as of February 28, 2019. 81.2% of the OTW's expenses go towards maintaining the AO3. This includes the bulk of our server expenses—both new purchases and ongoing colocation and maintenance—website performance monitoring tools, and various systems-related licenses (access all program expenses). This year's projected AO3 expenses include US$110,000 in contractor costs for upgrades and security testing. Additionally, AO3 expenses include a significant server overhaul and expansion of roughly US$177,000. New virtualisation servers will replace the current equipment, making testing and deployment of code for the Archive much smoother. The old servers will be repurposed as storage for the new servers. Other new servers will expand the Archive's capacity to serve pages and search results to users with fewer connection issues. Other anticipated costs include US$33,000 for a Systems contractor, who will do some work for the Archive's hardware infrastructure. US$329.34 spent so far out of US$6,738.97 total this year, as of February 28, 2019. Fanlore expenses are mostly its allocation of server purchases, maintenance and colocation costs, in addition to Fanlore's web domain renewals (access all program expenses). The new virtualisation servers mentioned above will also serve Fanlore pages and store Fanlore wiki backups. US$275.00 spent so far out of US$1,833.00 total this year, as of February 28, 2019. Transformative Works and Cultures ' expenses are the journal's website hosting, and publishing and storage fees (access all program expenses). US$91.82 spent so far out of US$936.17 total this year, as of February 28, 2019. Open Doors' expenses consist of hosting, backup, and domain costs for imported fanwork archives (access all program expenses). US$0 spent so far out of US$5,000.00 total this year, as of February 28, 2019. Legal's expenses consist of filing fees and travel expenses for conferences and hearings (access all program expenses). US$0 spent so far out of US$500.00 total this year, as of February 28, 2019. Budgeted expenses include US$100 for printing flyers and US$400 for other convention outreach activities on behalf of the OTW (access all program expenses). US$2,296.25 spent so far out of US$31,460.00 total this year, as of February 28, 2019. Our fundraising expenses consist of transaction fees charged by our third-party payment processors for each donation, thank-you gift purchases and shipping, and the tools used to host the OTW's membership database and track communications with donors and potential donors (access fundraising expenses). US$2,785.99 spent so far out of US$50,471.80 total this year, as of February 28, 2019. The OTW’s administrative expenses include hosting for our website, trademarks, domains, insurance, tax filing, and annual financial statement audits, as well as communication and accounting tools (access all admin expenses). The OTW is entirely supported by your donations—thank you for your generosity! We receive most of our donations each year in the April and October fundraising drives, which together should account for about 67% of our income in 2019. We also receive donations via employer matching programs, royalties, Amazon Smile, and PayPal Giving Fund, which administers donations from programs like Humble Bundle and eBay for Charity. If you'd like to support us while making purchases on those websites, please select the Organization for Transformative Works as your charity of choice! Given your generosity in previous years, we have a healthy amount in reserves, which we plan to keep in store for a rainy day. Thanks to this, we can explore alternative revenue sources to supplement your donations. The Finance team has made progress in its search for a suitable investment method for a small non-profit organization like the OTW and aims to fully set up a low-risk, conservative investment portfolio by the end of 2019. The reserves also help bolster us in years when we’re planning larger than usual purchases. As mentioned previously, we have plans to replace old server hardware over the next few months as well as purchase new server hardware, which significantly increase our expenses for this year. Some of the forecasted expenses outlined in this budget may not take place before the end of the year, due to various constraints. To account for this uncertainty, even though all expenses we anticipate are described in the budget spreadsheet, we have projected a withdrawal of US$96,000 from our reserves to cover the amount corresponding to the less likely expenses. This additional amount may be withdrawn from reserves on an as-needed basis during the year. Our budget update, which will be published in October, will contain more precise information about which expenses will take place in 2019. US$23,840.99 received so far (as of February 28, 2019) and US$419,475 projected to be received by the end of the year. If you have any questions about the budget or the OTW's finances, please contact the Finance committee. We will also be hosting an open chat to answer any questions you may have. This chat will take place in our public chatroom on April 6 at 8pm UTC(what time is that in my timezone?). Here is the link to the chatroom! Come chat with us, and bring your questions! 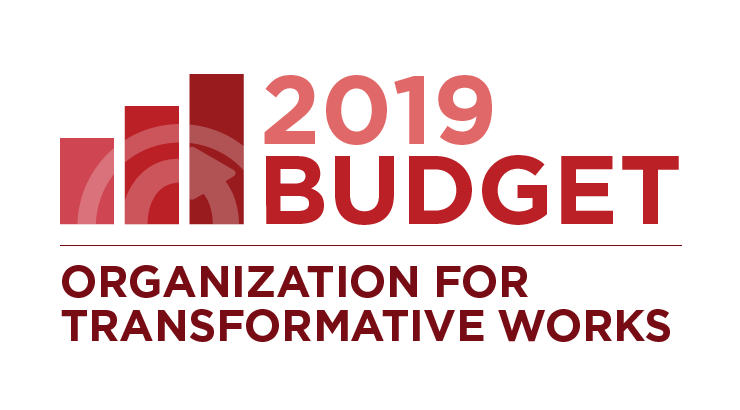 To download the OTW's 2019 budget in spreadsheet format, please follow this link. I wish I had the money to donate towards what is such an important thing to me. One day I'll have a steady job and be able to support the things I love. Seriously though, it's fascinating to look things like this over, and it's nice to have it be so open, so we all know what our money is going towards and planned to go towards. Thanks for all your hard work. Thank you for doing and organising all this! i really appreciate you guys being out in the open with how your finances are! Really hoping I can donate soon--keep up the good work! If anything, that's an indication of just how hard the OTW are dedicated to their transparency--that they're paying through the nose to have an independent body check their accounts and bookkeeping to prove they aren't embezzling any funds. So a big chunk of what we are paying for, *is* that very honesty and integrity and transparency the OTW values. (It's a shame it has to cost that much, though.) In the future, if I see any of the ignorant gits whining about how all these drives are "a scam," I'll just shoot this link at them. And also, yes, auditing is expensive. It requires multiple highly trained individuals to go through the accounts in fine detail to ensure not only that that there's no embezzling or fraud going on, but also just to check for routine bookkeeping and accounting mistakes, and a whole array of other things. It's not uncommon for this process to take weeks, or even months (depending on the size of the organisation and the quality of their bookkeeping), and there are vast quantities of documents to be prepared and filed. It's not just a matter of looking at the accounts for five minutes and saying "yep, those are fine, now give me $18,000". Auditing is HARD. It's a job that requires a huge amount of training just to even get qualified in the first place, followed by continued training EVERY YEAR just to stay on top of the regularly changing laws and standards. Auditors work bloody hard for the money they charge for auditing an organisation's accounts. Yeah, *I* actually know all that; peace. I wasn't trolling :) I used to volunteer for a nonprofit and had a spouse who was an accountant. This was in the UK and Scandinavian countries, though, and my observation was related to it being more costly in the US--strenuous auditing is not a legal requirement in all European countries for nonprofits, either, so that was the perspective I was speaking from. But it's good that you pointed all of that out--something that can, again, be used to enlighten the, erm, less enlightened about just where all the donation money goes. Yeah, I'm UK-based, so I'm more familiar with those requirements - here, it's any charity with income over £25,000 that has to have some kind of external examination of their finances, which usually means getting an independent party to do the accounts, but not necessarily an audit. And then over £250,000 requires an audit. I'm uncertain what the thresholds are for auditing in the US (and from what I've learned about accountancy and tax in the US, it varies by state - I do not envy US-based accountants and auditors), but... yeah, it's not like the OTW is wasting money on it. If they're over the income threshold in the state they're registered in, it's a legal requirement, and they'd be breaking the law by NOT doing it. Yeah, again, I know--I apologise if anything in my message made it look like I didn't. But going further into the cost issue would get political on my part, and I'd better not right now. I've never commented on these admin posts before, but reading through this makes me so thankful for the OTW's existence. Thank you for all the hard work you guys do, and for the transparency! Very interesting to look through. I'll finally be able to donate this year! Thank you for this detailed and very interesting overview! It is great how you always keep us informed! Many thanks once again for all the work you do "behind the scenes" (and in front of it, too, of course)! Thanks for the update, and, as always, thanks for all the hard work that goes into keeping these projects up and running! Love the transparency, love the planning. Honestly, this inspires me to be better with my personal budgeting!